Machine is equipped with an infeed conveyor approx. 4 ft. in length. 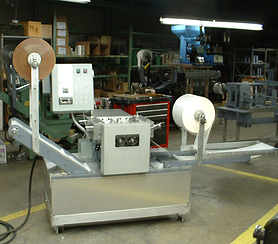 Motion of the infeed conveyor is intermittent for filling buckets or trays from automatic feeders, placers or manually. It can be made continuous (optional) for higher speeds. Pouches are formed from two supply rolls of packaging material so similar or two different packaging materials can be used for example transparent for one side and opaque for the other.